Greener Grass» Blog Archive » DAY 10. The sun is shining and the waves are small. The vessels sails very steadily. I work. The feeling of being in between seems to continue. I climbed to film on the mast again yesterday. It was really windy! Tomorrow’s immigration is a little bit scary to me, because I usually end up to trouble. We’ll arrive to US at night and then there is the pilot and all the that stuff on the river. I guess I get out of the ship sometime in the morning. Too bad I don’t have Bruce Springsteen’s ”Streets of Philadelphia” on my laptop. 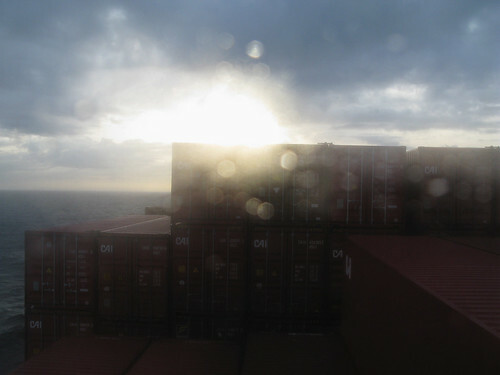 This entry was posted on Monday, October 25th, 2010 at 8:02 pm and is filed under Transatlantic voyage, Travel diary. You can follow any responses to this entry through the RSS 2.0 feed. You can leave a response, or trackback from your own site.